Born in Co. Donegal, Ireland, Ian Kennedy came to Canada in 1954 where he attended Burnaby North High School and earned a B.A. from U.B.C. Later he did post-graduate work at Queen's University, Belfast and on his return to Canada taught Geography and History at Steveston Secondary School for thirty years. 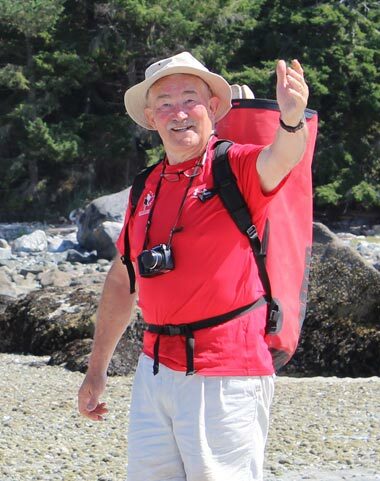 Following his retirement in 1999 he married Judith, moved to Comox and became a rugby journalist, traveling the world and writing about a game he never played very well. Widely published in many magazines, his journalism also includes numerous articles about history, travel, motorcycling, cottage living and pubs. He always takes Fridays off to play golf with the Wolf Pack. Ian Kennedy is co-author of 'A Guide to the Neighbourhood Pubs' (1983) and 'The Pick of the Pubs' (1986). 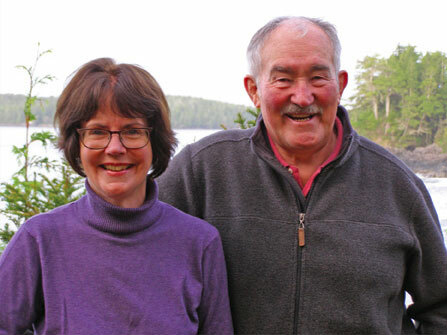 In 2010 he published 'The Life and Times of Joseph McPhee, Courtenay's Founding Father' and in 2014, with Margaret Horsfield as co-author, Harbour Publishing presented 'Tofino and Clayoquot Sound: A History'. Shortlisted for the Roderick Haig-Brown Regional History Prize at the 2015 B.C. Book Prizes. Clayoquot Sound, on the West Coast of Vancouver Island is not only a place of extraordinary raw beauty, but also a region with a rich heritage and fascinating past. Tofino and Clayoquot Sound delves into all facets of the region's history, bringing to life the chronicle that started with the dramatic upheavals of geological formation and continues to the present day. The book tours through the history of the Hesquiaht, Ahousaht and Tla-o-qui-aht as well as other nations that inhabited the area in earlier times. It documents the arrival of Spanish, British and American traders on the coast and their avid greed for sea otter pelts. It follows the development of the huge fur seal industry and its profound impact on the coast. It tracks the establishment of reserve lands and two residential schools. The coming of World War II is discussed, as is the installation of a large Air Force base near Tofino, which changed the town and area dramatically. From here the story spirals into the post-road period. With gravel and asphalt came tourism, newcomers, the counter-culture of the 1960s, the establishment of Pacific Rim National Park and, of course, surfing. The book also addresses logging--which became the main industry in the area--and its questionable practices, going into detail about the "War in the Woods"--the world-famous conflict and largest mass arrest in Canadian history. A place is shaped by its people, and Horsfield and Kennedy highlight notable figures of past and present: the merchants, the missionaries, the sealers and the settlers; the eternally optimistic prospectors; the Japanese fishermen and their families; the hippies; the storm- and whale-watchers; the First Nations elders and leaders. 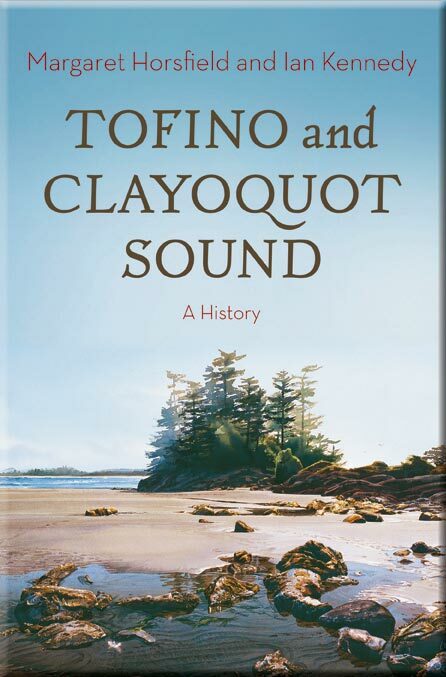 Offering an overall survey of the history of the area, Tofino and Clayoquot Sound is extensively researched and illustrated with historic photos and maps; it evokes the spirit and culture of the area and illuminates how the past has shaped the present. Margaret Horsfield was born in Port Alberni and educated in Canada and England. Margaret worked for many years making features and documentaries for BBC Radio in Birmingham and London. She has contributed to CBC Radio’s Ideas and she has wide experience in print journalism. She now resides in Nanaimo, BC. Her previous books include Voices from the Sound (Salal Books, 2008), Cougar Annie’s Garden (Salal Books, 1999), Biting the Dust (Fourth Estate, 1997) and, co-written with Peter Horsfield, Beyond Golgotha (Brechin Books, 1993) and Beyond Bethlehem (CBC Enterprises, 1989). At the time, the idea made no sense. Why would anyone want to create a city out of the dense 'forest primeval' on the west bank of the Courtenay River? Such a challenge would require foresight, determination and an unlimited capacity for hard work. Joseph McPhee possessed all these qualities. Often called "The Father of Courtenay" Joseph McPhee chose the location, created the town plan, and put in place the institutions that shaped this community. With dogged persistence and unwavering commitment, he strove to build the city that today is one of the most enviable places to live in all of Canada. 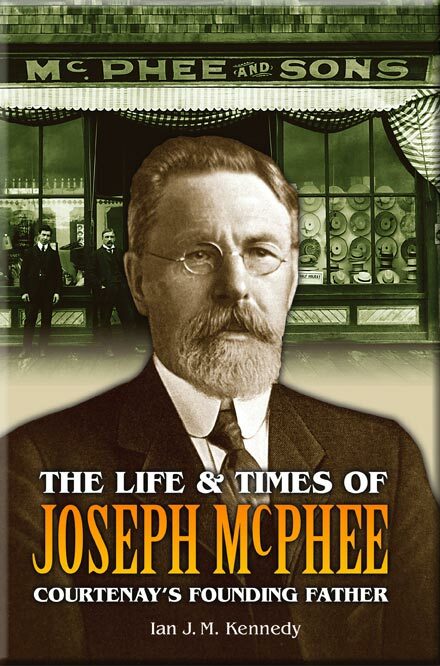 Who was Joseph McPhee? What fuelled his ambition to build a city in the Comox Valley? How did he become the most successful merchant in the area and what drove him to achieve his goal? Armed with a strong work ethic and a determination to succeed, the ambitious McPhee left his native Nova Scotia and arrived in British Columbia in 1871. Once he reached the Comox Valley, he never looked back. Here he made his mark, seizing every opportunity, fully convinced that this area had a brilliant future. In The Life and Times of Joseph McPhee: Courtenay's Founding Father Ian Kennedy tells the compelling story of McPhee, his vision, and his achievements. Set against the broader history of the Comox Valley, the story of McPhee’s life and of Courtenay's evolution is a "must-read" for anyone interested in the history of northern Vancouver Island. Intensively researched, this book brings to light a wealth of new material, recounting the very human story of the man, his dream, and the birth of a community that continues to reflect McPhee's enduring influence. "Kennedy is to be congratulated for managing to produce anything at all given that Savary (Island), all 8 1/2 kilometres of it, is somewhat off the beaten track of history. The most engaging segments are his anecdotes from the past. For the horde of current-day cottagers who descend on the island in summer, and for the handful of diehards who tough it out through the less-than-tropical off-season, Kennedy's work is a must." SUNNY SANDY SAVARY outlines the geology and geography of Savary Island, the pre-historic First Nations myths about it and the Sliammon tribe’s early habitation of it. Captain Vancouver named the island in 1792 when he sailed past it, but where the name comes from remains shrouded in mystery. The first resident fell victim to a ne’er-do-well’s bullet before, just prior to W.W.l, land developers saw the Island’s potential as a summer resort and divided it into 50-foot lots. For decades, the vagaries of the economy have dictated Savary’s development but recent years has seen the island become one of the most sought after cottage retreats of the B.C. coast. 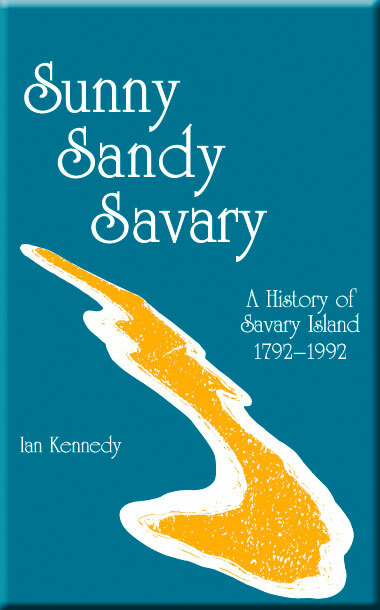 Author Ian Kennedy has owned property on Savary Island since 1980 and as an historian set out to write the definitive history of the whole island in time for the bi-centenary of Captain Vancouver’s naming of the island on July 1, 1792. Now in its third printing, this is a must-have for all Savaryites and those interested in B.C. Coastal history. Following the success of the first Pub Guide, Kennedy and Elliott struck out to cover the significant pubs of BC from the Rockies to the Pacific and from the U.S. border to Mile 101 of the Alaska Highway. Covering 40,000 kilometres they visited 211 BC pubs and eventually selected 93 for inclusion. The book is filled with local history, maps and photographs. 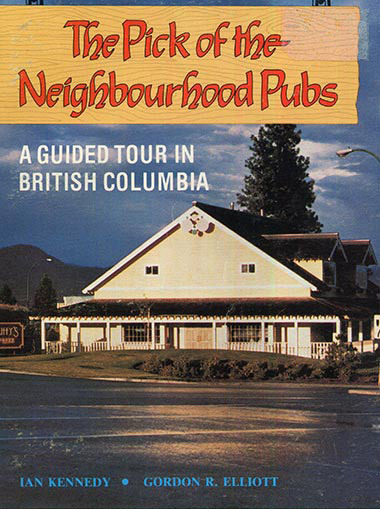 In 1974 the newly elected NDP government in BC introduced Neighbourhood Pub licenses to offer citizens a choice of drinking venues and break up the monopoly of hotel owned “beer parlors.” Based on British pub guides the authors enumerate, describe and provide maps for 77 pubs in and around the Lower Mainland. 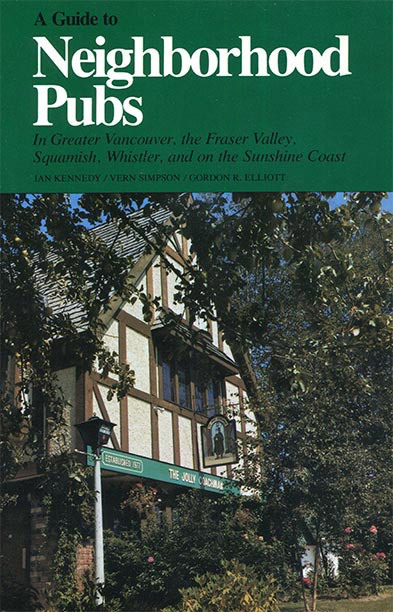 The book ranks as B.C.’s first Pub Guide.